Spring Training doesn't mean much. This is a point that's been made time and again, but the lesson that the first, blessed taste of baseball in over 4 months should more or less be treated with a shrug and a yawn is a hard one to accept. If the White Sox got one thing right about this off-season, it's that in a rebuilding year, or a quasi-rebuilding year, or a toeing the waters of competition but probably not going to swim and didn't even bring a swimsuit year, it makes no sense to spend frivolously on back-ups, and spots 21-25 of the roster. Even the worst farm system of the last few years can scrap together a few fungible relievers and a grown man capable of fielding a grounder. So the positions--or roles--being fought for aren't important, but they're there, and we're here, staring and waiting for a narrative. The first battle isn't really a battle, as Tyler Flowers can't really do anything to take Pierzynski's starting job besides break his wrist again. However, 2012 is viewed as a transition season, where the hope is that Flowers will show enough effectiveness with his high-strikeout ways to take the reigns and fill space in 2013. So while there's no question who the Opening Day starter will be, the possible fight for playing time will get plenty of attention. It already has. 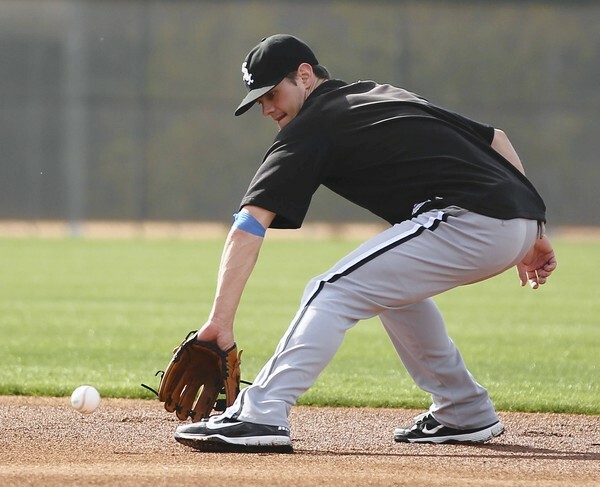 Everyone appreciates what Pierzynski offers to the team, but if Flowers can remind manager Robin Ventura how much he enjoys watching walks and strikeouts as well, it will determine how far beyond the 200 plate appearance mark he creeps. It will probably take Pierzynski giving the OK to a mid-season trade for that total to go far beyond 250. 25th man - Eduardo Escobar vs. Ozzie Martinez vs. The Field? When Kosuke Fukudome was signed to a major league contract, the White Sox could have accused of overdoing their outfield depth. Actually, they couldn't. Their Opening Day outfield starters will be the worst hitter in the AL last season, a career minor leaguer, and a prospect. They'll need outfielders. But with Adam Dunn pretty much incapable of manning a position, they'll really need one of those grown men who can field a groundball. Unless Brent Lillibridge isn't an outfielder. Ventura reiterated that Brent Lillibridge will work at shortstop as the likely backup to Alexei Ramirez. The last time The Bridge stalked the infield...well, it was to play 1st base on a whim instead of Adam Dunn. But before that...it was pitching in at 2nd base last year after Gordon Beckham got hit in the face by a Alex Rios' throw. But before that, it was his stint at 2nd base in 2010 when a case of the Steve Sax Disease marred his work replacing Beckham. While Lillibridge certainly has athleticism, his work at shortstop is not well-regarded, and this is frankly the first time Brent Lillibridge playing the position in the majors has been suggested in quite some time. It was, however, his primary position the last time he was in AAA. Alexei Ramirez has started 154 games in each of the last two seasons, so it's unlikely that Lillibridge could be bad enough for it to matter to total team performance. What matters as far as the roster is that if the most challenging infield position can be pawned off by Lillibridge, what use is there for any no-hit middle infielders? And maaaan, Ozzie Martinez and Eduardo Escobar are a couple of no-hit middle infielders. Escobar was pretty far from having a hold on AAA pitching as a 22 year-old last year, slashing .262/.303/.354, and after a promising cup of coffee in the bigs in 2010, Martinez had an aawwwwffffulll time in AAA in 2011 - .245/.296/.322. Maybe Ozzie was sleepwalking through his year in Florida, planning an escape to Chicago the whole time. For my money, another spare infielder would be of use, but it's hard to imagine what Escobar or Martinez could do to impress if there's no premium being placed on up-the-middle fielding. It's also hard to imagine how switching Lillibridge as a full-time infielder is a sane way to respond to his outfield heroics last season. Opting instead for Jordan Danks as a 5th outfielder who never gets to bat would be fun, but pointless. Delwyn Young as a 5th outfielder would probably just be pointless. Clay Davenport depressingly projected 1B Dan Johnson to be the 3rd best hitter on the team in 2012, but save for 13 games, he's only played the same position as #1 and #2 on that list at the major league level. It just felt right to mention the possibility of Dan Johnson playing 3rd base--or arguing that his bat is needed--in the same conversation where Brent Lillibridge is playing shortstop. It's hard to tell what the hell the White Sox are going to do anymore. A bananas Spring Training could help any of these candidates, though if they opt for safety, Martinez seems like the favorite. Both he and Escobar belong in AAA, but Escobar has a better chance of actually getting better if he stays there. Closers - Matt Thornton vs. Jesse Crain vs. The Inevitable Rise of Addison Reed. Addison Reed has the best stuff of the three candidates. Ventura said Addison Reed has qualities you look for in a closer but doesn't think that's going to happen right now. I just spent hundreds upon hundreds of words discussing the oddities of the 25th man race, so it's only fitting to gloss over a role that might actually matter. But if Reed is out on account of the "needs to pay his dues" clause, then this race lacks drama. Jesse Crain is an extreme fly-ball pitcher with control problems and a statistical record that begs the question, "How does he do it", and he'll have to overcome Thornton already being the favorite. Thornton should win the role, and be just fine, even if he's just a notch down from being heinously overqualified for the 9th inning like he was 2008-10. About the White Sox bullpen situation, Dylan Axelrod said "three spots is pretty rare to find in the big leagues." Hoping he wouldn't notice that. Sure enough, this combination of open real estate on the roster and lack of certifiably ready minor league arms allows for a lot of major league dreams to get launched this Spring. Just how many, probably depends on Axelrod. Now that they're officially locked out of the rotation, what becomes of Zach Stewart and Dylan Axelrod will determine how many spots are open, because as pure bullpen candidates, they clearly lap the field. Stewart's sinking fastball could be even more of a weapon with the mid-90's velocity that would come in short burts, and Axelrod's plus slider could make him superb against righties in limited action. But a starting rotation that features Jake Peavy is probably well-advised to have some depth ready and available. The Sox could keep one of the Stewart/Axelrod combination on the major league roster as a longman/spot starter and stash one in AAA Charlotte, convert one permanently to being a short-inning reliever and keep another as a longman, or just use them both as normal relievers until further notice. It might just behoove the club to put both of them on the roster; they're worthy and the field from which their replacements would be drawn is very eeeeeeeehhh. Brian Bruney leads the list of outside candidates, mainly because he made it up to the big club last season and was sorta effective in portions. He's also lost 30 pounds, which makes him look like Nick Swisher. Between him, imported Marlins farmhand Jhan Marinez, Leyson Septimo, Gregory Infante or Deunte Heath, if any of these "live arms" could show the ability to throw strikes with consistency, it'd be a revelation big enough to deserve a roster spot. From there, it's pick-your-even-more-marginal-White-Sox-relief-prospect. Nathan Jones, Brian Omogrosso, Eric Stults, and pretty much any random breakout candidate seems worth a looksie, especially if Simon Castro, Nestor Molina, Hector Santiago, and Jake Petricka are all going to be kept on track as starters. Not that any of them are ready, anyway. Peg me down for Stewart, Axelrod, and Bruney, and for casting doubt upon Donnie Veal's inevitable 65-save season right up into September. That's all for now, though I'm sure that by the end of the first week of Spring Training games, there will be a whole new set of fake of crises to address. I don't like Thornton as closer because, as a man wiser than I in these matters once wrote: "Ohman is fine, but having Thornton available for killer lefty-stocked innings would make things a shade easier." Thornton facing the toughest lefties the last time through the order, whether that is in the 8th or 9th, seems to me to be the way to go from a winning-baseball-games-on-paper kind of perspective. What may be more important this season is to build up Thornton's trade value, in which case I'd be down with Thornton as closer. At any rate, "Brent Lillibridge: closer" has a nice ring to it. When was the last time he pitched? Or maybe that would be The Bridge too far? Thanks, I'll be here all week . . .
Yeah, I did say that, and have made it known I'd just like to see Addison Reed rip everyone apart from the first day of Spring Training to the degree where he's given the job relatively soon. But, if Robin's going to play it super cautious and act like there's some big learning curve between the 8th and 9th innings, then I'd opt for Thornton over Crain. As good as Jesse's been, there's an unsustainability to his success that could blow up real fast. In general, I favor non-traditional bullpen usage to correspond to the leverage of a situation. Leaving the 9th inning up to ole #18 might be putting "a Bridge over troubled water"
Crain as your closer would be more non-traditional right? Because then you'd be free to use Thornton against tough lefties late and Reed against tough righties. Crain would be used for one or two out saves in some cases, depending on matchups. What do you call it when Lillibridge chases one down and lays out for a catch in the alley? Bridgin' the gap? I would say "Lillibridge went all the way across Madison County for that one"
I suppose the optimized non-traditional usage would still have Thornton identified as the number one guy, but make it non-verboten to have Crain record the "save" in the 9th after Thornton had gotten through the 3-4-5 hitters in the 8th. In the realm of things that will actually happen, giving Crain the "closer" title would just mean giving the less-talented reliever the highest position. The highest-leverage situations are still most likely to happen in the 9th. I think my standards are plummeting by the day. So long as Ventura doesn't do a press conference with Brian Bruney announcing "This guys just LOOKS like a closer to me", I'll probably be fine. standards? we don't need any freakin' standards this year!